This month has not been a good one for the largest profession in healthcare — nursing. Two reports have once again ratified what nurses have been complaining about for years. That is the fact that cuts in nursing care and poor working conditions impact patient health. When patient care suffers nurses, not the systems that decide to cut back on their services, get blamed. Once again, in too many settings, nurses are asked to nurse against odds that are stacked against them as much of what I wrote almost ten years ago, in my book —Nursing Against the Odds — keeps happening over and over again. The bad news about nursing appeared this month in two articles in British Medical Journals. One was in the BMJ and the other in Quality and Safety in Health Care another BMJ publication. The BMJ article is about nurse burnout and is entitled “2013 was a horrible year for nursing — nurses are “burnt out” chief says.” The chief in question is Peter Carter head of the Royal College of Nursing. He explained that nurses have been scapegoated because short staffing has made it difficult if impossible to deliver high quality care. Instead of identifying the system that decides it can do without nurses as the problem, nurses and nursing are identified as the culprits when there are not enough of them to respond to patient needs. The lack of sufficient nurses was apparently one of the things that was responsible for what was known in Britain as the Mid Staff scandal. This refers to the Mid Staffordshire NHS Trust, where among other things a diabetic patient die because two nurses failed to give her insulin. “Prof Berwick, a former advisor of President Obama, told a conference of medical leaders and senior managers in London that the failings in Stafford occurred because hospital staff became blind to what was going on around them, assuming that the standards which were being tolerated were normal. Prof Berwick said NHS staff should not distance themselves from what happened in Stafford or reassure themselves that they would have done differently, and that the same failings could not happen elsewhere. Lucian Leape echoed Berwick when he commented that, “A substantial barrier to progress in patient safety is a dysfunctional culture rooted in widespread disrespect.” This disrespect was manifest in Apparently one of a lack of resources, lack of managerial support and sufficient time with patients, among other things. In such a situation, as Carter explained in the recent BMJ article, staff becomes “burnt out” and that leads to what appears to be callous treatment of patients. But what is the chicken and what is the egg here? The public is tempted to blame the individual when people hear about patient deaths, nurses or others ignoring the pleas of patients for care. The hospital, ward, whatever, people think, is staffed by a bunch of bad apples. The apples are the problem, not the conditions in the barrel, or the people who filled it. But, with rare exceptions, in each and every case of harm to patients, the system is to blame. Even if a unit is staff with a bunch of rotten apples, the question we have to get is how did they get there, who hired them, and why was their conduct ignored? There is no way those who administer complex systems can continue to blame the individual when we now know that scandals like this are poster boys for the Swiss Cheese Model of Error in which every slice of cheese has to line up perfectly so that a scandal like this can erupt. And in the case of this hospital like many others, someone manufactured those slices, laid them down in perfect order and kept them there. It is hardly surprising that staff faced with poor conditions staff become burnt out. This kind of burn out, researchers explain, produces serious personal and professional problems. As another article on burn out in the New York Times explained, burn out exists when, “you feel overwhelming exhaustion, frustration, cynicism and a sense of ineffectiveness and failure. Initially it referred to those employed in the human services — health care, social work, therapy and police work — but has since expanded to all sorts of workers, said Christina Maslach, professor emerita of psychology at the University of California, Berkeley.” Burnt out workers are, by definition, unsafe workers. When they are not cared for, it is very hard for them to care for others. Although I will talk about the other article in Quality and Safety in Health Care in my next post, I want to comment on the issue of burn out, what it can produce, and a typical management response. 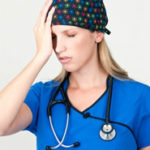 One of the big problems in patient safety is that managers somehow expect the human brain to function effectively in situations that cause burn out, and in which workers — whether professional or non-professional — are expected to function both safely and effectively in situations which defy the brain’s ability to function safely and effectively. Overwork, stress, fatigue, hunger, lack of respect, interuptions, multi-tasking, all of these and more make it very difficult if not impossible for people to deliver safe patient care. Yet, hospital managers and healthcare policy makers are ruled by the fantasy that people’s sense of professionalism can trump or override the brain’s capacity to pay attention, make difficult decisions, register and analyze complex information when people are hungry, exhausted, stressed out, constantly interrupted, abused, or face any other of variety of conditions that are epidemic in healthcare. I once talked to a health care manager who wondered if I could do a team training in a clinic in which a supervisor, who had been suspended during an inquiry about his conduct, was returning to work. It turned out, the health system decided the supervisor’s conduct did not warrant firing him. When the decision was made to return him to his leadership responsibilities in the clinic, clinic staff were very worried that he would retaliate against them because some had complained about his behavior. Others worried that he would be — as he had been before –hostile and angry. I asked the manager if he thought there was a problem with the supervisor and that the staff had legitimate worries. He confessed that the supervisor had some serious anger control issues. I asked whether the supervisor had received any anger management coaching or any other kind of coaching while he was off work. No, the manager reported. Why, I inquired, did the manager think that team training would help in a situation where the team leader had this kind of problem? Well, he replied, I should hope that the staff would act in an adult and professional way when the supervisor returns to the job. Adults acting like adults? Staff acting professionally and rationally when stressed out and worried? What world was this man living in, I asked myself (although not him)? What planet was he on? Not the one that I, to my constant dismay and chagrin, inhabit. Professionalism, however, was his clove — or head –of garlic to wave in the face of the vampire of human reaction to abuse, disrespect and a stressful work environment. I declined the invitation to do a team training in an environment when the very basics of organizational support for teamwork were so clearly lacking. Sadly, the kind of organizational support for teamwork is all too often lacking in many other workplaces and nurses, other staff, and patients like those at Mid Staff bear the brunt of systems that do not understand how real people function in real workplaces when they are not treated in a professional manner. We have to stop blaming the victim and looking at how the Swiss Cheese is lined up if we don’t want patients to fall through.